JENNESS – The French American Jazz Ensemble! About Jenness > NewsBlog > Announcements > JENNESS – The French American Jazz Ensemble! It is official! Jenness Rouse is now a member of the elite LA Music Industry, beginning as the lead singer in the new French/American Jazz Ensemble, JENNESS. It was a match made in heaven when the Ekoués met Jenness Rouse at her Summer 2017 RMPConcert, “It’s Time.” (Click on link to learn more about the concerts). Harpist Maïwenn Ekoué and Bass/Sax Player Willy Ekoué after meeting at Jenness’s live show, The RMPConcerts, at the Hudson Theatres in Hollywood in July and August 2017, continued to perform with her, following her to Texas for her JENNESS ROUSE & FRIENDS’ Extravaganza in 2018 as a summation of the RMPConcert season. Upon their return to LA, the musicians known as Sonates en Duo at the time, asked Jenness to join them in a new venture of creating their own new music group. Jenness lept at the challenge and the three musicians spent the majority of the 2018 year building a new repertoire consisting of French Jazz, Broadway Classics, Film Score ballads, and Blues, appearing once for a private event early on to “break the ice” for their new sound. 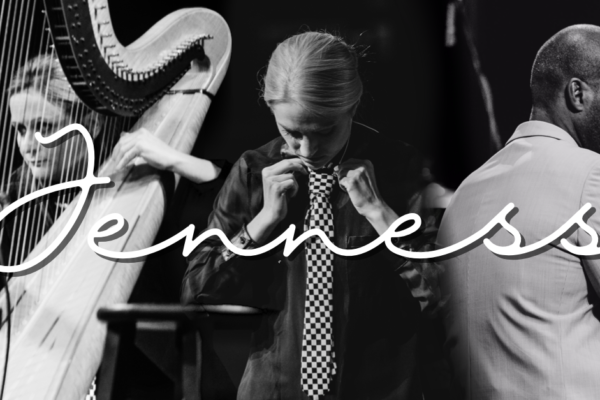 In March 2019, the musicians collectively decided on naming their ensemble after the name of their lead singer, “JENNESS,” a decision based upon its French Origin, relevance as a member’s first name, and dual meaning (in French and English). Coming spring 2019, these musicians will begin to tour under the new French Moniker with new music and arrangements. Stay tuned!